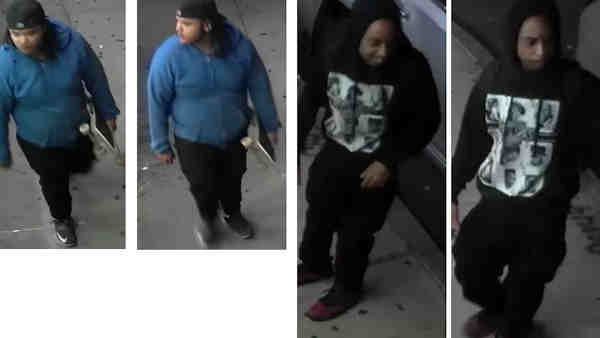 WILLIAMSBURG, Brooklyn (WABC) -- Police are looking for two men wanted in connection with a series of robberies in Williamsburg. Around 3 a.m. Sept. 25, a man was skateboarding with friends on Jackson Street and Meeker Avenue when four men started talking to him. One of the men grabbed him from behind and forced him to the ground. Another took his backpack, which contained a Pentax camera, an iPhone 6, ID, passport and three books. Another man took his skateboard and hit him with it. The unidentified men fled east on Jackson Street. The victim suffered back pain but refused medical attention at the scene. Around 4 a.m. Sept. 25, a man was walking near Jewel Street and Meserole Avenue, when three men came up to him. One man hit the victim in the face with an unknown object. The men then took the victim's iPhone, wallet, $300, ID and MetroCard, and fled. The victim got eight stitches for a cut on his chin. Around 4:30 the same night, the victim was walking south on Diamond Street at Meserole Avenue, when two men came up to him from behind. One of the men punched the victim in his face, knocking him to the ground. They went through the victim's pockets, then took a Samsung Galaxy 7, a wallet, $80, ID and bank cards. Then they fled. The victim refused medical attention at the scene. The next day around 5 a.m., a 33-year-old man was walking south on Leonard Street, at Engert Avenue, when two men, one carrying a skateboard, approached him. One of the men had a knife and took the victim's iPhone 6 and American Express card. The suspects fled on foot north on Leonard Street. The victim was not injured.